SC2 Map Analyzer analyzes melee maps and creates PNG images and CSV spreadsheets with the results. It measures shortest paths between key locations, computes "openness" around the map and measures positional balance! Use it to gather data on the official maps or help develop your own. The whole usage model has changed; the analyzer is no longer intended to ever be run as a command line tool. Instead config files control the analyzer and you double-click the executable (or a shortcut to it) to start it up. Map formats from beta phase 1, beta phase 2 and post-release are supported now. The analyzer's model for pathing is much more precise; just compare the ramps in the before and after above. The analyzer also recognizes pathing fills and the painted pathing layer. The footprints.txt config file allows pathing footprints to be defined for any unit or doodad. With some help from the community we can fill this file out until the analyzer is aware of every bitty doodad that can affect pathing. For now it has the resources, watchtowers and destructibles. Read the manual here and check out details about what the analysis calculates and the FAQ. 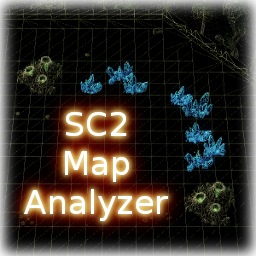 If you have any feature requests or do something cool with SC2 Map Analyzer, let me know! Hi, I'm trying to download sc2mapanalyzer on my windows 7 side of my macbook pro, but I keep getting the errors: "libpng-3.dll" and "zlib1.dll" are missing when I try to run the sc2mapanalyzer. This doesn't work anymore. Just says it can't load the MPQ Archive of newer maps. I'm setting the output path to a legitimate path - C:\Users\*\Documents\StarCraft II\Maps\sc2mapanalyzer-release-1.4.3. I am getting the error message "warning, unrecognised output option" followed by above path etc..etc. Can't fin anthing in the search, can anyone help? Khalan3: it works fine with Blizzard maps. Several people have tried to run the tool and it didn't work on Blizzard maps that they downloaded from websites. 1. Open the SC2 Editor. 2. Go to open a file and at the top of the dialog there is a tab for Battle.net files. 3. Sign into Battle.net when prompted. 4. Choose a Blizzard map, Blistering Sands say, and it will open it in the editor. 5. Save this opened map to your hard drive and then configure the map analyzer's to-analyze.txt with a path to that saved version. 6. Viola! Just to get this straight, it currently displays destructible rocks on the image? If not, it should, I haven't checked a map with a rock, :p.
Terren05, the analyzer does detect destructible rocks. In the output image is shows you the shortest paths with rocks because most people want to know the rush distances which are really important early game, before armies can effectively knock down rocks. If you use the tool to enable the CSV per map (a spreadsheet file) it will spit out the shortest path distances with and without rocks. If you really want the images without rocks too I could add a quick feature for that. Would be nice for it to detect desctructible rocks, when creating the shortest paths. I have gotten the new formats sorted out (with as many maps as I can test, anyway) but I am knee-deep in some major improvements as well. I won't put out a new release until the tool is "put back together" basically, and some day job stuff flared up where I worked over the last two weekends. Short version: I got busy, but I'm back on the analyzer and there will be a nice new format+new feature release coming! I find ver1.2 works with the beta maps and 1.3.2 to work with the newer maps. Seems like the issues have been sorted out? Although I'm working on a bunch of issues, so there are some undocumented changes in there. Look for the output in the same directory as your maps and otherwise it should be fine. A much better release is in the works. Older maps do work. So newer maps doesn't work at all or do I make a mistake? DarkJ3JB, You're right I haven't made any releases lately, but I am hard at work on it. There are a lot of big internal changes I am making, like a series of configuration files, that will help you customize the tool to get exactly what you want. One of the planned files is a way to specify what shortest paths you want to measure, and main->nat will definitely be something you can get. I haven't gotten everything put together for it yet, but I expect you will be able to say other things like give me the shortest path for "main -> gold" and "main -> island" and stuff like that. AND you can say "ignore rocks" yes/no. There will be a big update, but I have a lot of things on my plate, like getting the new internal file formats fixed (they changed the editor with Phase 2), for instance. I haven't used this for a while but I believe that you haven't updated it since my last use, it would be really nice to have it analyze the distance from the main to the natural for each starting location. Reason is to see if someone has an unfair advantage to expansion distance. Good news man, it works for me now, with ALL map files. However, there are a few glitches - the analyzer crashed when it found something along the lines of a 'invalid pathing cell' (keep in mind it's not word for word) on one of the maps I tested. I'm guessing this happens when the guy who creates the map presses shift for doodads and other things (allowing them to stack and ignore terrain) so you might want to fix that - but otherwise gj. I especially like how it now shows you a lot more information about what went wrong, etc. I am using Windows XP. I did drag the map onto the application. Ardnived, have you tried it the other way around? Drag the map onto the application? In Windows Vista I cannot even drag an executable onto a non-executable! What version of Windows are you using? PNGwriter::plot_text - ERROR : Free Type: Could not find or load font file. ERROR: Cannot load resources for PNGwriter: you may need to run this program as an Administrator. 0 warnings and 1 errors were reported.